Eric Friedman, right, who lives nearby, takes video of a Mariner East 2 pipeline work site at Shepherd Lane in Glen Mills on Wednesday. Because of permit violations, construction of Sunoco's Mariner East 2 pipeline was halted Wednesday by the state Department of Environmental Protection, which said the company must meet certain conditions before it will be able to resume work. Eric Friedman, right, who lives nearby, takes video of a Mariner East 2 pipeline work site at Shepherd Lane in Glen Mills on Wednesday. Because of permit violations, construction of Sunoco’s Mariner East 2 pipeline was halted Wednesday by the state Department of Environmental Protection, which said the company must meet certain conditions before it will be able to resume work. Pennsylvania’s Department of Environmental Protection on Wednesday suspended all construction on Sunoco’s Mariner East 2 pipeline, saying it has violated the conditions of two kinds of permits. “Sunoco must cease all construction activity on the pipeline project, except for maintenance of erosion controls and limited maintenance of horizontal directional drilling equipment,” the DEP said in a statement. 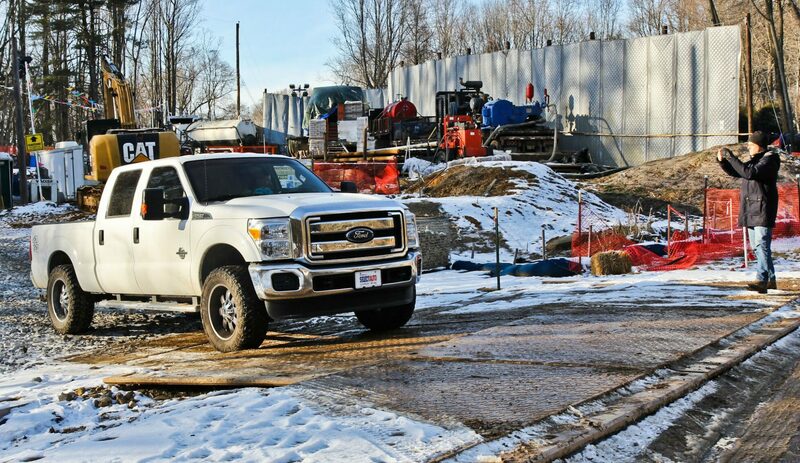 DEP directed the company to submit details on how it plans to prevent drilling mud spills – or “inadvertent returns” – that have challenged the project in their dozens since construction began last February. The $2.5 billion, 350-mile long pipeline will carry natural gas liquids from the Marcellus Shale in Western Pennsylvania and eastern Ohio, to an export terminal near Philadelphia. The majority of the gas will be sent to a plastics manufacturer in Scotland. The order follows many spills along the cross-state natural gas liquids line, which were first reported on by StateImpact when construction resulted in well water contamination for residents of a Chester County community last July. Further reporting revealed even more spills. A court order last summer directed the company to re-evaluate geology at more than 60 sites. In November, Sunoco delayed the projected completion of the line until the second quarter of 2018. Sunoco has 30 days to submit information to DEP in order for the agency to review whether to allow continued construction of the Mariner East 2. Pipeline spokesman Jeff Shields says the company plans to comply with DEP’s request. Elise Gerhart, a Huntingdon County resident who has battled Sunoco over eminent domain, says she has her doubts that Sunoco will even follow the DEP’s order, and she says the move does not signal the end of the pipeline. Attorney Rich Raiders, who is representing the Gerhart family in their eminent domain battle against Sunoco, says DEP’s action is surprising, and the stop-work order is both substantial and rare. “It happens occasionally, but to do so you have to convince DEP that their existing tools just aren’t going to work,” said Raiders. Raiders says the governor’s office has come under pressure from the public, their elected representatives and possibly DEP employees themselves who recently learned Sunoco had been drilling in areas where the company had no permits to do so. Joe Minott, executive director of the Clean Air Council, applauded DEP for its action. He said he believes the permits were “rushed” before regulators ensured that Sunoco met all the regulatory requirements. “Now we see exactly what happens when you don’t give strict permits as required by the law, and have the resources to monitor it,” Minott said. Sunoco’s work on the Mariner East 2 pipeline has been suspended by the Pennsylvania environmental protection department. This photo, taken Wednesday, shows a work area off Fallbrook Lane in Glen Mills, near Philadelphia. He called Sunoco “not a trustworthy company” that has ignored public health and safety and harm to ecosystems during its construction of the pipeline. “Hopefully, DEP will really pause and take the time to look at how egregious the behavior of Sunoco has been throughout this process, and re-do the permits and make sure it’s being done properly,” Minott said. Lynda Farrell, executive director of the Pipeline Safety Coalition, called the DEP’s decision “stunning” and “remarkable” after many months in which Sunoco’s critics accused the DEP of taking a hands-off approach to regulating Mariner East 2. “This is an illustration that people with different approaches to the inherent problems of this project worked toward a common goal to say ‘enough is enough,'” Farrell said. She attributed the decision in part to recent calls by lawmakers including state Senator Andy Dinniman and state Rep. Leanne Krueger-Braneky for a halt to construction, and to at least 500 phone calls to the office of Gov. Tom Wolf over the Christmas holiday period to urge him to suspend construction. Kurt Knaus, a spokesman for the Pennsylvania Energy Infrastructure Alliance, a pipeline advocacy group made up of local chambers of commerce, labor unions and engineers, urged Sunoco and DEP to quickly resolve the issues. Knaus says all stakeholders, including Sunoco, want the pipeline to be developed safely.